Oscar winning actor Philip Seymour Hoffman is dead. He was found dead at his New York home today Sunday February 2nd of an apparent drug overdose. He was just 46 years old. Law enforcement officials said the acting veteran was discovered fully clothed in the bathroom on the 4th floor of his Manhattan apartment with a needle sticking out of his arm. He was discovered by his friend and screenwriter David Katz, who went to check on him when he failed to pick his children up. Its being reported that five bags of used heroin were found around the late actor’s body by police and a further two unused nearby. 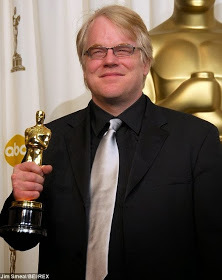 Hoffman won a best actor Oscar for his role in the 2005 film Capote. He is survived by a partner of 14 years and three children.